Dr Patricia Rico (Universitat Politècnica de València, Valencia, Spain) explains in this post the background and main results of her recently published work on the intriguing effects of borax in the formation of muscular tissue. Boron is one of the 109 elements that make up the planet, usually as part of a mineral called borax, a salt of boric acid. Even if in trace amounts it is found everywhere. It is a vital micronutrient in plants and may be essential for animal growth and development. The role of boron in the life cycle of plants is well documented. However, little is known about boron homeostasis and function in animal cells. Due to the unique bonding and structural properties of this interesting element and because the biochemical and mechanism of action of boron is not yet fully understood we decided to investigate possible effects of borates in mammalian cells. In our publication we set out to investigate whether boron promotes cell differentiation per se when released from a PLLA based system. We used C2C12 myoblasts, widely accepted as a cell culture model for muscle differentiation. To evaluate the biological activity of borax-loaded materials (2 % and 5 % borax), we quantified the expression of sarcomeric myosin and the presence of fused myotubes in C2C12 myoblasts as markers of myogenesis. Myotube formation was significantly higher on the PLLA-borax 5 % substrates (Figure 1-A and B) as compared with the PLLA-borax 2 % and PLLA ones. Surprisingly, myogenic differentiation was considerably more robust on the PLLA-borax 5 % than on collagen type I, which represents a standard substrate for myogenic differentiation and independently of the final cell number (Fig 1-C). To ensure that the effect on cell differentiation was due solely to the borax released into the culture medium, we used culture media with two different concentrations of borax, whereas cells were seeded on FN-PLLA surfaces. Both solutions of 225 µg ml-1 and another one diluted 10 times (22.5 µg ml-1) showed enhanced myotube formation (Figure 2-A) and similar level of differentiation than cells cultured on PLLA-borax 5 % (Fig. 1). Our results demonstrate that both, sustained release of borax from PLLA and borax itself enhances myoblast differentiation at a very early stage, probably accelerating the entry of cells to the differentiation pathway earlier than control myoblasts and reveals the potential of borax to induce fusion into multinucleated myotubes. Due to the important role of extracellular Ca2+ plays in muscle development, with various previous reports demonstrating the importance of Ca2+ signalling in the activation of myogenic transcription factors and myogenesis and also its implication in migration and/or fusion of myotubes, we wondered what role plays borax in relation to Ca2+. We performed different studies using 1) addition of CaCl2 in the culture medium, 2) a chelating agent (EGTA) to sequester metal complexes (e.g. based on Ca2+) and 3) verapamil as a calcium channel blocker directed against L-type Ca2+ channels in muscle cells. Myotube formation under different conditions was evaluated (Figure 3). Results showed that the addition of CaCl2 has a positive effect on myotube formation in absence of borax (FN-PLLA, Figure 3-B) as we expected based in previous reports. The observed effect of CaCl2 seems to be null on PLLA-borax 2 % and 5 % substrates (Figure 3-A and B), which strongly suggests that the enhanced differentiation associated with the presence of borax involves a mechanism that has to do with the presence of Ca2+ in the medium as well. To test this further we assessed that either the chelation of Ca2+ in the culture medium (addition of EGTA) or the blocking of the Ca2+ channel (verapamil) led to strong effects on myotube formation for all samples analysed, which further reveals that the effect of borax depends strongly on the presence of Ca2+. Our explanation of this effect lies in the fact that borax actually chelates Ca2+, as is widely used for water softening (calcium ion sequestration) in detergents. In this case, addition of extracellular Ca2+ might sequester borax released from PLLA and prevent its association and active transport. The formation of the complex borate anion-Ca2+ would involve less Ca2+ available and as a result similar effects to EGTA or verapamil chemicals were obtained. We also analysed the effects of borax in the gene expression of two myogenic regulatory factors, MyoD and Myogenin, as they are essential transcriptional regulators of skeletal muscle differentiation. These myogenic transcription factors are controlled by cellular signalling, resulting in repression of their activity in proliferating myoblasts and enhanced activity during myogenic differentiation. qPCR results showed values in line with previous observations obtained by immunostaining and quantification analysis. Understanding and guiding muscle repair and regeneration is an area of intense research with a potential for use in new applications in muscular diseases therapies such as Duchenne muscular dystrophy and other new breakthrough therapies in the long term. Our results here contribute to this novel and promising research area, as they suggest a potential effect of borax enhancing myogenesis at early initial steps. Further research is needed to shed light on the molecular mechanism of borax in mammalian cells. 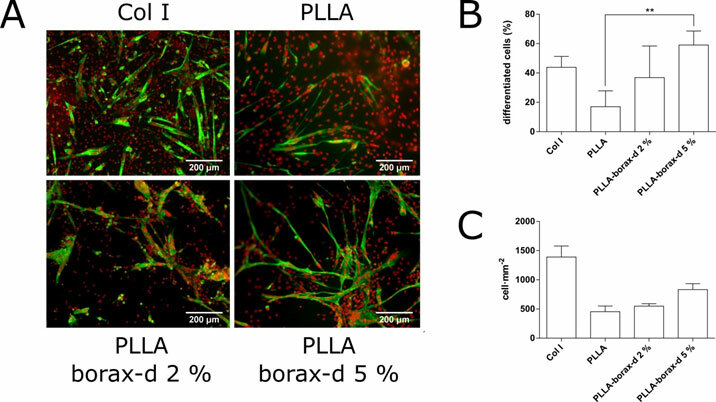 Borax-Loaded PLLA for Promotion of Myogenic Differentiation. Rico P1,2, Rodrigo-Navarro A1,3, Salmerón-Sánchez M3.